In the vein of satirical blogs like The Hawkeye Initiative (which tackles the male gaze in the depiction of female characters in comics) and S**tPeopleSaytoWomenDirectors (which shows sexism in the film industry) is the awesome Tumblr allmalepanels that documents the widespread gender gap in speaking engagements and publications. The blog began in March 2015 to document all male panels, seminars, events, and various other things featuring all male experts. It features images and screenshots of panels spanning a myriad of subjects and industries, featuring only men, complete with a stamp of The Hoff (one of the world’s truest masculine icons). It’s an information sausagefest out there. All-male panels are endemic, and the issue is particularly true in Muslim communities. And yet, it should not and does not have to be this way. Zahra Billoo has compiled a list of female Muslim speakers, providing a digital Rolodex of amazing Muslim women. altM editor Margari Aziza Hill’s article, Organizing Gender Inclusive Events in the Muslim Community, shares how to include women in speaking engagements, so that all male panels don’t happen. It’s easy to brush off popular culture as a separate and contained sphere of life, but look no further than the latest issue of TIME Magazine to be reminded of just how completely false any such notion really is. 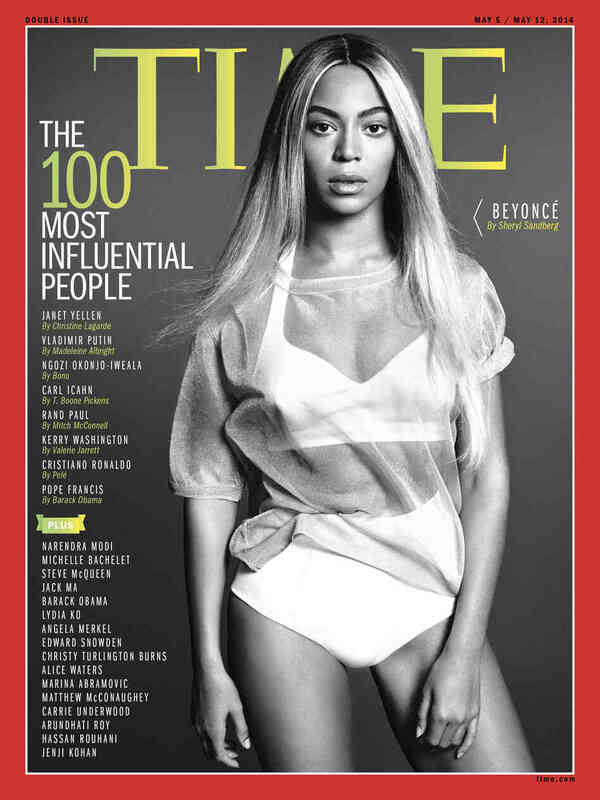 On the cover of the annual “100 Most Influential” article is none other than Beyonce. In her underwear. Who wrote her endorsement? Sheryl Sandberg.